In our last segment we included a passage written by Emperor Akbar's court historian, Badayuni, describing the mood displayed by the emperor at Fathpur Sikri around the time he established his center there for religious assemblies and debates. Badayuni suggested that Akbar had heard about the activities of the Governor of Bengal, Sulaiman Kararani, and was inspired to make a similar showing of rigorous religious practice. "When he heard that Sulaiman Kararani, governor of Bengal, used every night to offer tahajjud (night long prayers) in the company of some 150 persons consisting of renowned Shaikhs and Ulama, and used to remain in their society till morning listening to commentaries and exhortations, and then, after offering up the morning prayers, would occupy himself in State-business, and the affairs of the army, and of his subjects and when also news arrived from Badakhshan of the coming of Mirza Sulaiman, who was a prince of Sufi tendencies…"
Sulaiman Kararani served as Governor of Bengal from 1563-1572. A.D., taking office less than 30 years after Lord Caitanya Mahaprabhu's Disappearance. Known as the Afghan King of Bengal, Sulaiman Kararani was working to gain his own power in North India, having unfortunately missed the opportunity to become liberated in Mahaprabhu's golden light. Instead, this Afghan intruder worked his way from Bengal down into Orissa, creating havoc amongst the local Hindu citizens. Upon arriving in Bengal, the Mughals quickly began pushing into Orissa, and the Oriyas were gradually driven southwards over a long period of time. For a while, the Damodar River served as the boundary between the kingdoms of Bengal and Orissa, with Midnapore and the Arambagh sub-division of Hooghly district standing as the frontier of the Orissa Kingdom. "In 1568, Sulaiman Kararani, the Afghan King of Bengal, sent a force southwards under his son Bayazid, who, passing through Jharkhand penetrated to the heart of Orissa. The Oriya king was defeated, and soon afterwards killed while suppressing a local revolt. Midnapore, with the whole of Orissa up to the Chilka Lake, then passed under the sway of the Afghans. The rule of the Oriyas thus lasted for about 4-1/4 centuries and Midnapore, as a frontier tract, was constantly exposed to raids and invasions. The existence of direct route from the Dakhin-Radha to Orissa (via Midnapore district) can also be proved by the fact described "in the biographies of the great Vaishnava apostle Chaitanya, who, in 1509, passed through the district on his way to Puri. After crossing the Damodar and Mantreswar rivers Chaitanya came to Hajipur and thence went via Midnapore and Narayan-garh to Jaleswar on the Subarnarekha river." Of course, Midnapore was still within Orissa, even during the end of the 16th century, as "according to institutes of Acber (Akbar) Orissa, in its greatest dimensions in 1582, was divided into five districts, viz., (i) Jellasir (Jaleswar), comprising Midnapure, (ii) Buddruck, (iii) Cuttrack, (iv) Cicacole, (v) Rajamundry." Later in this series we will look more extensively at the Mughal presence in Orissa, and how it impacted affairs at Lord Jagannath's temple in Puri. 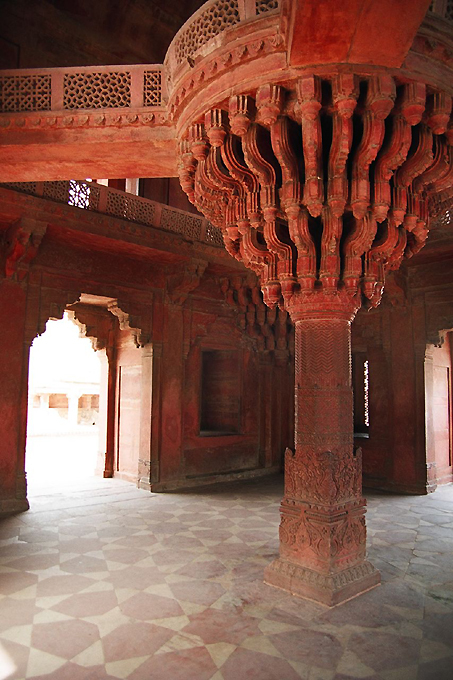 For now, the point is made that Akbar's religious conclaves at the Ibadatkhana in Fathpur Sikri, Rajasthan appear to have been inspired, at least in part, by the enviable conquests of his junior compatriot, Sulaiman Kararani of Bengal. To the delightful precincts of that mansion founded upon Truth, thousands upon thousands of inquirers from the seven climes came with heartfelt respect and waited for the advent of the Shahinshah. The world's lord would, with open brow, a cheerful countenance, a capacious heart, and an understanding soul pour the limpid waters of graciousness on those thirsty-lipped ones of expectation's desert, and act as a refiner. He put them into currency, sect by sect, and tested them, company by company. He got hold of every one of the miserable and dust-stained ones, and made them successful in their desires—to say nothing of the be-cloaked and the be-turbaned. From that general assemblage H.M. selected by his far-reaching eye a chosen band from each class, and established a feast of truth." "In the same assembly (ibadatkhana) the emperor then spoke through his auspicious tongue that 'I have organized this assembly (majlis) for this purpose only that the facts of every religion, whether Hindu or Muslim, be brought out in the open. The closed hearts of our (religious) leaders and scholars be opened so that the Musalmans should come to know who they are! (As) they themselves are unaware (about their religion): They only think of Muslims (i.e. themselves) as those who recite kalima, consume meat and perform sijda on the earth. (They should know) Muslims are those who wage war on their 'self" (jihad bin nafs) and control their desires and temper; and surrender (themselves) to the rule of law." The degree to which Akbar was intent upon creating a "feast of truth", as opposed to striving not to be outdone by his subordinate in Bengal, we will hope to discover in the segments to come.